DSP464 – Sundance DSP Inc.
DSP464 is a quad channel ADC module in a conduction cooled PMC/XMC format with a powerful 1 GHz PPC processor(MPC8548E) from freescale, 512MB of DDR2 SDRAM and a large FPGA (Virtex-5 XC5VSX95T-FF1136 or XC5VLX110T / XC5VFX100T) from Xilinx. This versatile module is based on the Linear Technology’s LTC2208 16-bit A/D converter. An extremely flexible clock distribution circuit based on AD9510 adds capabilities like system-wide synchronous clock, phase adjustment of the ADC and output clocks. 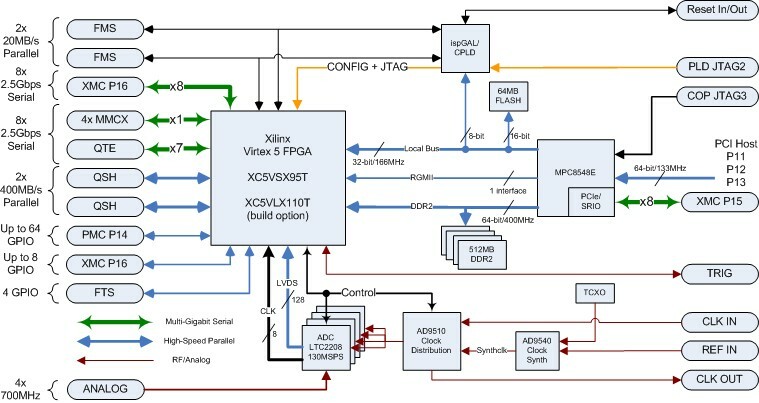 On-board clock synthesis is based on AD9540 low jitter DDS clock synthesizer. Coupled with temperature compensated reference oscillator, the clock generation is able to provide sub-Hz frequency resolution down to 10Hz accuracy.